A few days back we mentioned that a Carmelite Rite Mass was due to be celebrated on Ascension Thursday. We are pleased to be able to present some photos of this historic event, celebrated by Fr. Romaeus Cooney O. Carm. 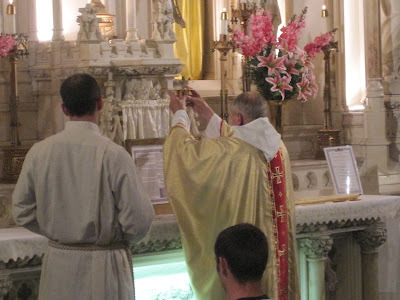 In the Carmelite rite, the bread and wine are offered concurrently; hence the paten on top of the chalice at the Offertory. Those who would like to see some historic stills of the Solemn Mass in the Carmelite rite, may wish to see our post here. These stills are taken from a video recording which you may begin to watch below.